In October of 1968, the world’s focus – or much of it, anyway – shifted to Latin America. The main event of the month was the 1968 summer Olympic games, which took place in Mexico City, Mexico, from October 12 through October 27. 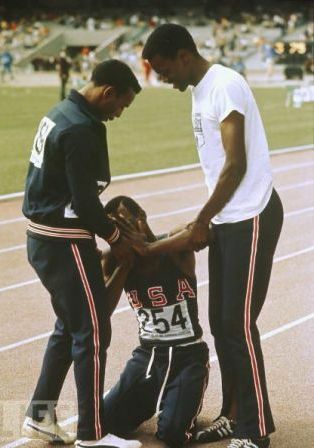 The games provided, in my memory, two iconic moments: The first is U.S. long jumper Bob Beamon collapsing in disbelief after breaking the world record for the long jump by an astounding 21 inches (55 cm). The second, and likely more well known, is the human rights protest by African-American sprinters Tommie Smith and John Carlos, who raised their black-gloved hands during the awards ceremony for the 200-meter run. But several other major events of the month took place in Latin American, the most important of which might have been the Tlatelolco Massacre, as it’s come to be called. Beyond that, I am deleting from this post several additional paragraphs about the massacre, as the Wikipedia report has changed substantially in the past ten years, and I cannot be certain of the accuracy of what I wrote a decade ago. That post from ten years ago can be found here, and the current Wikipedia page on the massacre can be found here. Elsewhere in Latin American that month, Juan Velasco Alverado took power via an October 3 revolution in Peru; in Panama, a military coup d’état led by Col. Boris Martinez and Col. Omar Torrijjos on October 11 overthrew the democratically elected government of President Arnulfo Arias. There was also unrest in other portions of the world that month: On October 5, police in Derry, Northern Ireland, used batons to subdue civil rights demonstrators, an event often cited as the beginning of that country’s years of violence called The Troubles. In Jamaica, riots broke out on October 16 in response to the government’s banning from the nation the Guyanese author and activist Walter Rodney. In the U.S., the Defense Department announced on October 14 that the U.S. Army and the U.S. Marines planned to send 24,000 soldiers and marines back to Vietnam for involuntary second tours. Also relating to the war in Vietnam, by the end of the month, U.S. President Lyndon B. Johnson announced that peace talks in Paris had progressed well enough that he was ordering a cessation of air, naval and artillery bombardment of North Vietnam, effective November 1. So, in the midst of politics and blood and war, what did we hear that month when we sought solace in music? Boy, that’s about as representative (and maybe as good) as a top fifteen can get, I’d guess. You’ve got the mainstream rock of the Beatles, the country cross-over from Riley (O.C. Smith’s record might have gotten some country play, too, I think), straight R&B from Aretha and Clarence Carter and some psychedelic R&B from the Chambers Brothers. There’s Arthur Brown’s powerful rock. You’ve got some blue-eyed soul from the Rascals, pop from the O’Kaysions and the Bee Gees, and a little bit of bubble-gum from the 1910 Fruitgum Company. And then there’s James Brown’s uncompromising and funky proto-rap. Wow! A note from 2018: O.C. Smith’s “Little Green Apples” did not make the country Top 40 in Billboard, which I find a little surprising. The record did, however, go to No. 2 on the magazine’s R&B chart and to No. 4 on the magazine’s Easy Listening chart. There are a number of interesting records and names on that list. What might be most interesting, however, are titles and a name that aren’t there. In the previous week’s listing, the soundtrack to the film The Graduate had been in tenth place, featuring songs by Simon & Garfunkel as well as incidental music from the movie. When that album slipped out of tenth place, it marked the first time since March 16, 1968 – six-and-a-half months – that there was no mention of Simon & Garfunkel on the top ten albums list. Between the soundtrack to The Graduate and their own two albums, Bookends and Parsley, Sage, Rosemary and Thyme, Simon & Garfunkel had dominated the albums list as much as anybody during 1968. Note from 2018: I’m startled that I didn’t single out the Johnny Rivers album for a comment. Any listing I make of my favorite ten albums of all time will, I think, always include Realization. With those caveats, that’s a pretty good list of albums. And the album I’m posting today comes from the list: José Feliciano’s Feliciano! Still, Feliciano! is a good, if not great, album and it’s pleasant listening. It was Feliciano’s commercial peak, as only one other single and two of his succeeding albums – and he’s recorded prolifically – reached the Top 40. He continues to record, frequently in Spanish, and released his most recent album, Con Mexico en el Corazon, earlier this year. Note from 2018: According to Wikipedia, Feliciano has released seven more albums in the past ten years, one in Spanish and six in English (including two that were offered only as digital downloads). His most recent listed is the 2017 album As You See Me Now, recorded with Jools Holland. The credits for Feliciano! at All-Music Guide are slender and, I think, are incomplete. They do list Ray Brown on bass, Milt Holland on percussion and Jim Horn on flute, alto flute and recorder. The link above goes to a playlist of the full album at YouTube. When I heard the album for the time in the spring of 1972, I was a little skeptical. I knew the original version, of course, from the long set of three medleys on Side Two of the Beatles’ Abbey Road album, where it follows “Polythene Pam” and ends the second medley (leaving listeners with a brief moment of silence before Paul McCartney’s piano opens the final medley with “Golden Slumbers”). But the song itself – credited to the writing partnership of John Lennon and McCartney but written solely by McCartney – was such a brief snippet, running less than two minutes on Abbey Road, that I wondered as Cocker’s album played how it could be stretched to a full track. Well, Cocker didn’t stretch it a lot, but he and producers Denny Cordell and Leon Russell added a guitar solo between the verses and got the track to 2:37. Good enough. But as we replicate Joe Cocker! with covers, which other version of “She Came In Through The Bathroom Window” do we use? There are plenty to choose from. Second Hand Songs lists twenty-two covers, and there are more listed at Amazon. No doubt there are others not listed either place. Booker T & The MG’s included the song in an instrumental medley on McLemore Avenue in 1970. It’s a decent version, but it isn’t as good as some of the other covers on the Abbey Road tribute. Ray Stevens covered the song on Everything Is Beautiful in 1970, adding a funky voodoo rhythm behind his blah vocal. On 1972’s Feel Good, Ike & Tina Turner offered a herky-jerky, gender-flipped cover of the song laden with some of the most unpleasant shrieks of Tina’s career. The Youngbloods turned the song into a near-country shuffle on their 1972 album, High On A Ridge Top, adding slide guitar and some nice country-folk accents and harmonies. The Bee Gees took two stabs at “She Came In Through The Bathroom Window.” The first came for the soundtrack to All This And World War II, which, says Wikipedia, is a 1976 musical documentary that juxtaposes covers of Beatles songs “with World War II newsreel footage and 20th Century Fox films from the 1940s. It lasted two weeks in cinemas and was quickly sent into storage.” As to the Bee Gees’ contribution, the vocals sounded like the Bee Gees and no one else, but the orchestral backing was overly busy. With the addition of Peter Frampton, the Brothers Gibb took another swing at the song for the 1978 movie, Sgt. Pepper’s Lonely Hearts Club Band. Bracketed by “Polythene Pam” and “Nowhere Man,” the cover is as dull as one can imagine. I also noticed that the tune has been covered by several groups naming themselves with ghastly Beatle-related puns, including Yellow Dubmarine and Shabby Road. Another cover of the tune that caught my ear this morning came in 1979 from a Nigerian singer named Patti Boulaye, who included the song on her 1979 album, You Stepped Into My Life. The name was new to me, but Wikipedia says she was “among the leading black British entertainers in the 1970s and 1980s.” And that was the last cover listed at Second Hand Songs for eighteen years. In any event, the evident resurgence of interest in “First of May” included a pairing of Robin Gibb of the Bee Gees with G4 (described at Wikipedia as a “British opera boy band”) to record the song for the 2005 album, G4 and Friends. (There are several videos at YouTube of Gibb and G4 performing the song live in various venues.) And the most recent version of “First of May” listed at SHS comes from the Universal Daughters, whose 2013 cover – included on the album Why Hast Thou Forsaken Me – featured British singer Jarvis Cocker.